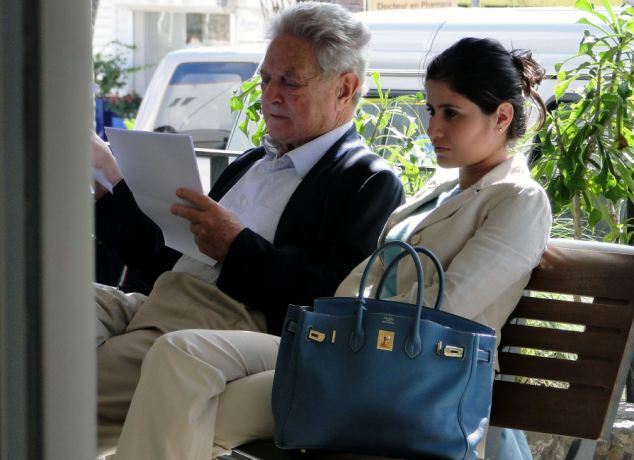 George Soros hit back: " Adriana Ferreyr is a money-grabber!" George Soros has hit back at his ex-girlfriend Adriana Ferreyr, who is suing him for $50 million, calling her a money-grabber who is trying to distort him for his fortune. Adriana Ferreyr, 28, brought a lawsuit against billionaire George Soros, 81, earlier this year for “severe emotional distress and damages” including an incident in which he allegedly slapped her in the face and attempted to throttle her. Adriana Ferreyr also claimed that George Soros – who is worth an estimated $14.5 billion – dumped her after a five-year relationship and went back on an agreement to buy her a $1.9 million Upper East Side apartment. The New York Post reported that George Soros’ lawyer served Adriana Ferreyr’s lawyers with papers arguing that the case should be dismissed. In those documents, billionaire George Soros states that they had an “on-again, off-again and non-exclusive intimate relationship”. The papers also claim Adriana Ferreyr tried to extract millions more as “part of her continued request to cash in on their casual relationship”. George Soros said in his papers that the claims he promised to buy his ex-girlfriend an apartment were “preposterous” and that she was “disappointed that Soros moved on to other women, ending her hopes of living in an extravagant <<dream apartment>> for free”. George Soros said Adriana Ferreyr accusations are “odious and utterly baseless” and that the lamp fell on her foot. Adriana Ferreyr’s lawyer told the New York Post: “These are chauvinistic and simplistic statements which are devoid of any reality. During an interview two months ago, Adriana Ferreyr also opened up about their five-year relationship and claimed that George Soros was tight-fisted and bought her nothing for the first three years. It was only in the fourth year that she even got a birthday present, the Brazilian soap opera star claims. Adriana Ferreyr said: “During the first three years, he gave me nothing, not even a birthday present. He changed and became cruel. I don’t know why he would do this to me. “George is so powerful, he thinks he can get rid of anyone he wants. But I am not going away. I am going to fight. Problems surfaced early last year, when George Soros allegedly promised to buy Adriana Ferreyr a Manhattan apartment but revoked his offer at the last minute. George Soros and Adriana Ferreyr broke up but reconciled until last August, when he allegedly revealed whilst they were in bed that he had given the apartment to another of his girlfriends, Tamiko Bolton, 39, his travelling nurse. During the ensuing row, George Soros is said to have choked Adriana Ferreyr and a lamp was broken which she stepped on, cutting her foot. Harlem: woman in critical condition after she was hit by a shopping cart thrown from a fourth floor walkway.